1. Saute bacon in saut� pan until rendered and lightly browned. Remove from the pan, leaving the fat still in the pan. 2. Increase the temperature of the pan to high. Add the shrimp to the pan and saut� just until lightly browned on both sides, but not completely cooked through. Remove from the pan. 3. Add the browned bacon back into the pan along with the onion and garlic. Cook for several minutes over moderate heat. 4. Add flour and cook for a couple of minutes. 5. Add clam juice, milk, and black pepper. Bring to a boil while stirring frequently. When it boils and thickens, add the shrimp back in and cook for several more minutes. Add hot sauce to taste. 6. 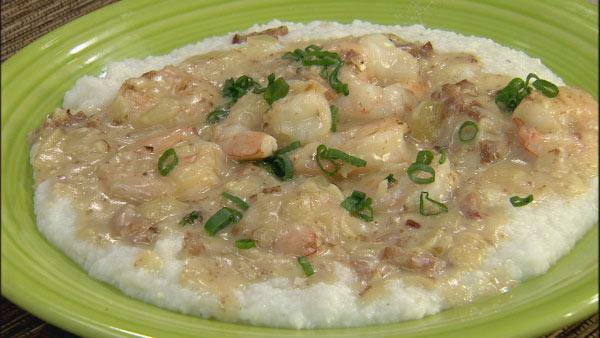 To serve, place some grits on a plate and top with the shrimp mixture. Sprinkle with green onions and serve. 1. Bring the water, clam juice, salt and pepper to a boil in a heavy-bottomed large saucepan. 2. Pour in the grits in a steady stream while stirring constantly. Once it comes to a boil, reduce heat to low. It is important to stir the grits often, being sure to scrape the bottom of the pan so that the grits do not stick to it and burn. It will take about 30 minutes until the grits become tender. Note: The key to great grits is the quality of the base ingredient -- the grits themselves. Purchase stone ground grits as they have a great flavor. If you cannot find white grits, stone ground yellow grits will also work well.